It’s Thursday! Which means it’s practically the weekend! Which means it’s cocktail time! 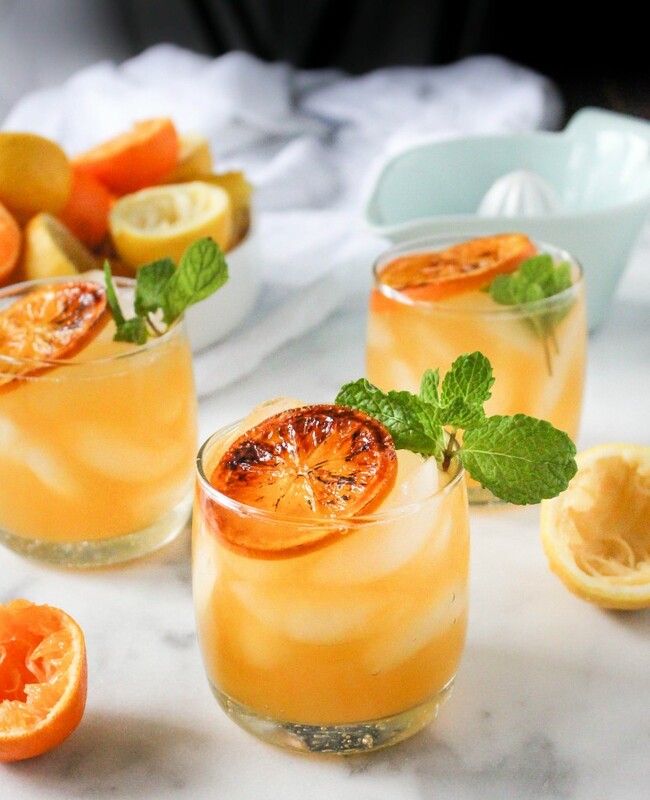 This cocktail is light and refreshing and perfect for winter. I don’t know about you, but I could always use a little pep in my step come mid January, after the “shiny, bright, and new” new year excitement starts to wear off. 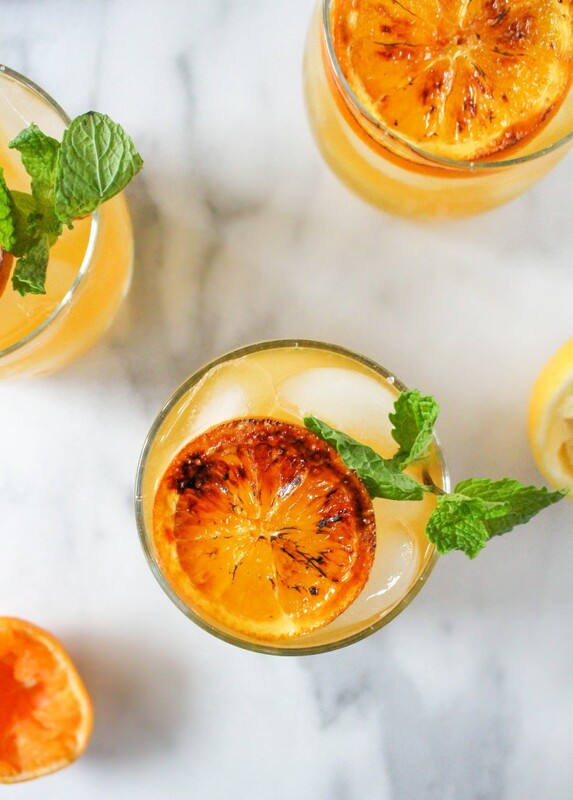 What better way than with a fun, bright, and fruity cocktail that is reminiscent of summer? While using seasonally winter ingredients? It’s basically the answer to all your winter doldrums conundrums. Lemonade is one of my most favorite things ever. Unfortunately, I did not grow up with freshly squeezed lemonade. We drank a lot of the powdered lemonade from a plastic barrel-looking container. You know the kind I mean? Yeah, that. I always added too much to my water and ended up with powdery mix at the bottom of my glass. And while I certainly didn’t mind it as a kid, I am a full-blown lemonade snob as an adult. Sorry! I can’t stand the taste (or texture!) of powdered drink mixes. Maybe that will be another kid regression I make in the years to come, hah. But yeah, I only want my lemonade made from freshly squeezed lemons. Total. Snob. Sometimes I even like to elevate things a bit and sweeten it with an infused simple syrup. Basil and mint are my favorite infusions. Especially on a hot summer day. Oh, oh! And I love tons of ice. Like, an absurd amount of ice. Because lemonade should only be consumed icy, icy cold. Snob? This cocktail is the best of all worlds. First reason: vodka. I’m totally a vodka girl. Secondly: clementines. I adore the little orange jewels and buy a case a week starting in early December and ending in January-February. The whole family loves them. You know when clementine season is coming to an end by the size of the fruit. During the next few weeks, you’ll probably start to see the clementines at your store getting bigger and bigger…and in my opinion, that signifies the end of clementine season. I have found that clementines are best when they are tiny because they’re juicier and sweeter. 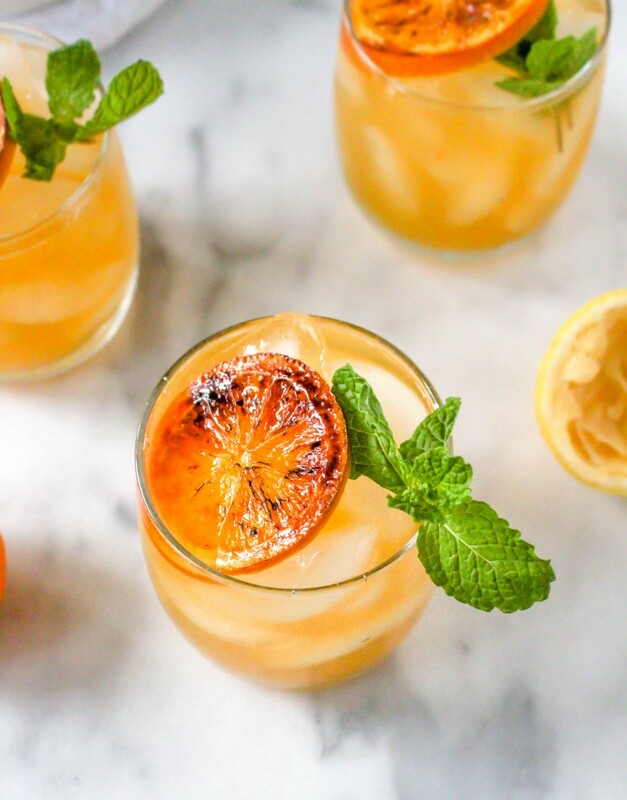 Which means that you NEED to make this drink soon! Like, now. 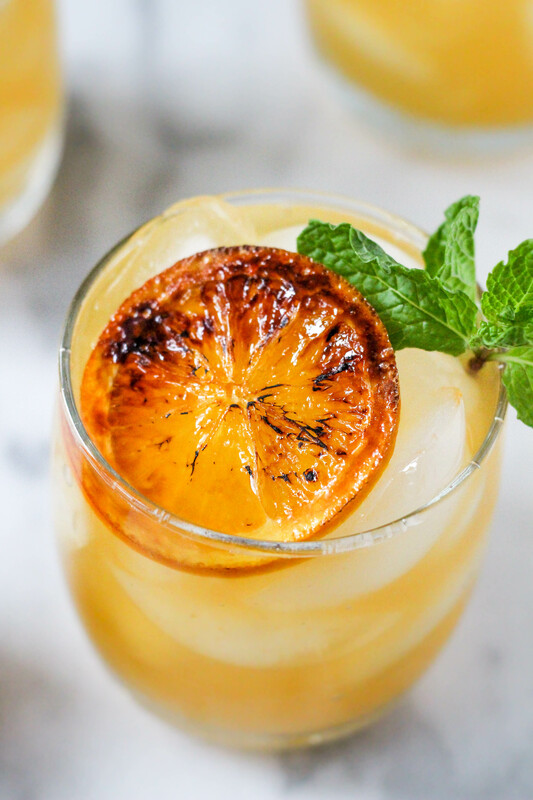 Not only is it deliciously citrusy and fun, but it’s topped off with the most gorgeous garnish of all time: brûléed citrus slices! Yes! It’s a thing. A glorious thing. I first got the idea for brûléed citrus after I saw people doing it to their morning grapefruits. I love grapefruit sprinkled with a little sugar, and once I tried it with a caramely, brûléed sugar crust, I was majorly in love. Completely hooked. So, naturally, I had to take that idea and run it into cocktail land. Which is the best land of all lands, am I right? Especially on snowed-in weekends. With a toddler. Bring on the mommy juice! Bring the water and sugar to a boil over medium-high heat in a small saucepan and simmer for 5 minutes, stirring frequently, until the sugar is completely dissolved. Allow to cool completely. 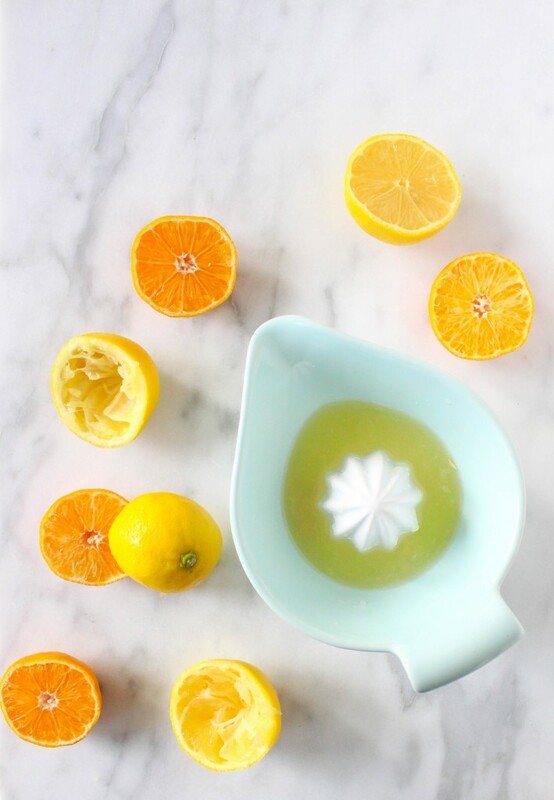 Combine the lemon juice, clementine juice, simple syrup (to taste), and water in a large pitcher, mixing well to combine. Taste, and adjust the sweetness as necessary. Chill in the fridge for a couple hours. 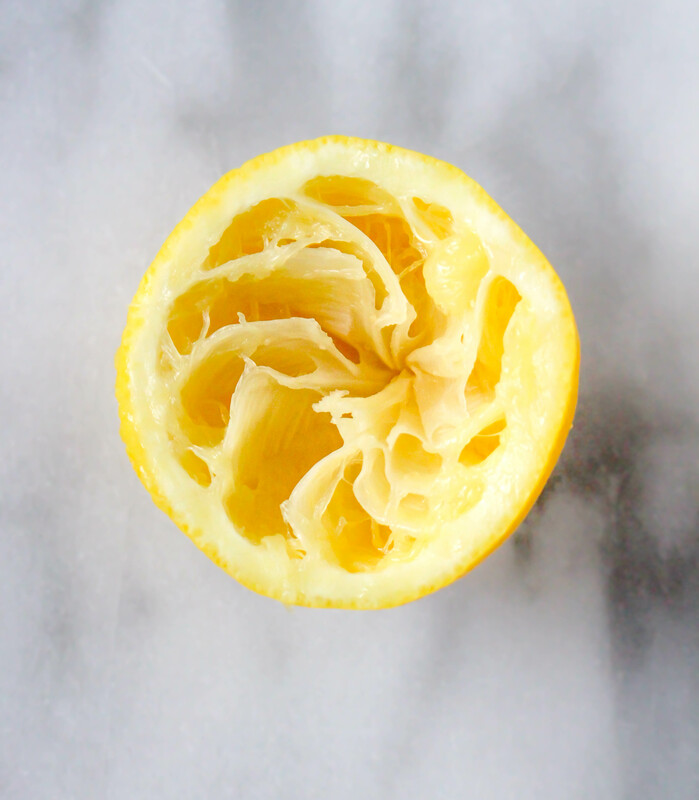 Slice the citrus fruit into ½-inch-thick rounds, leaving the peel in tact. 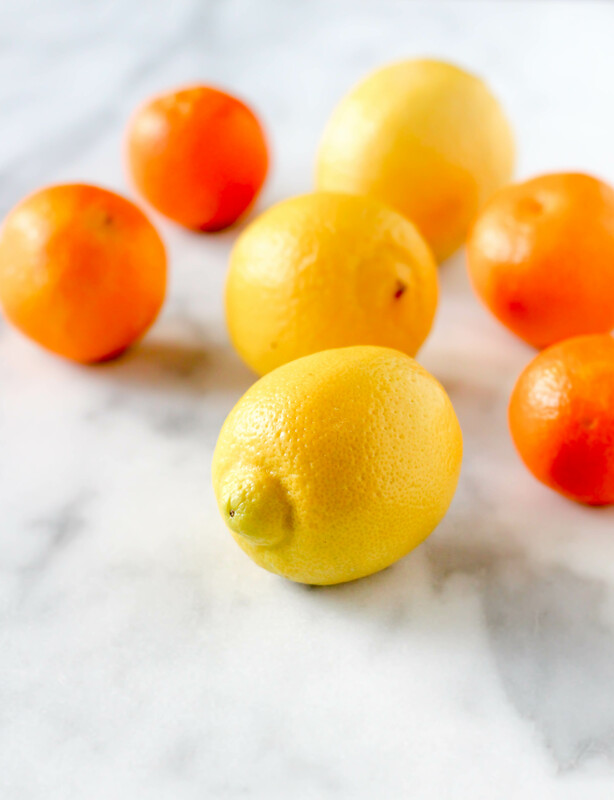 Place the citrus slices on a baking sheet lined with foil and pat them with paper towels to remove extra moisture. Sprinkle the turbinado sugar over the citrus rounds evenly. Using a kitchen torch, carefully melt the sugar until it is golden and crusty. Alternatively, broil for a few minutes in the oven. Allow the fruit to cool for a few minutes before handling. To a shaker filled with ice, add the lemonade, vodka, and St. Germaine and shake vigorously for 30 seconds or so. 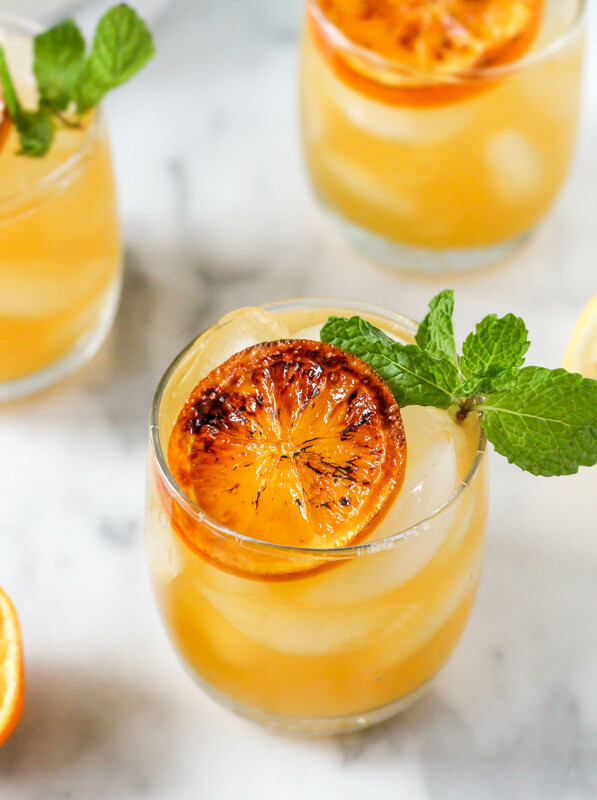 Pour the mixture into ice-filled glasses and garnish each glass with one or two slices (depending on the size/choice of fruit) of the brûléed citrus rounds and a sprig of mint. Serve immediately. while I can’t say I’m a lemonade snob, I can say that I do love lemonade in all its many forms – especially when alcohol is involved. I love the mint, too, and the char of the brulee. 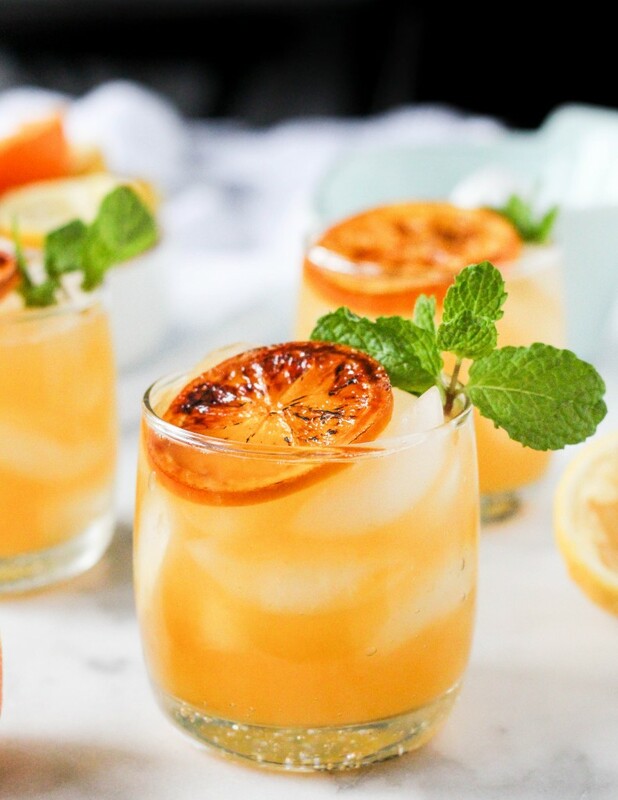 thanks for sharing this gorgeous drink!